Earlier this week thousands of Satmar Hasidim gathered at the Nassau Coliseum in Long Island, for an event led by the Satmar Rebbe, Rabbi Aron Teitelbaum. The purpose of the rally was to reassert Satmar’s rejection of Zionism, along with their continued non-recognition of the State of Israel. The climax was an address by Rabbi Teitelbaum, who spoke for just under one hour and twenty minutes. During his impassioned if somewhat rambling speech – subsequently made available online, despite platitudinous declarations against online technology made by speakers at the event – Rabbi Teitelbaum reviewed Satmar’s jaundiced version of Zionist history over the past century, and contended that the concept of a Jewish state is antithetical to Judaism. Ironically, he lamented the fact that in recent years Satmar devotees were openly happy when Israel succeeded on the international stage and in military campaigns. How is it possible, he asked, that the spiritual heirs of the ideology espoused by the Satmar sect’s founder, Rabbi Yoel Teitelbaum (1887-1979), could find anything positive to say about the State of Israel and its Prime Minister? Especially, he added, when the late rebbe had predicted that anyone who celebrated Zionist triumphs would not merit to rejoice in the coming of the Messiah. Truthfully, as a religious and deeply committed Jew, it is hard to know how to respond to this kind of hostility towards Israel by such a large and important group of orthodox Jews, many of them deeply sincere, when it is so clear that Israel represents the most important theological development for Judaism in thousands of years. While one can understand how rabbis during the early years of Zionism, and even after 1948, might have been concerned by the very secular nature of the Zionist leadership, and their callous rejection of any Jewish traditions or beliefs that did not dovetail with Zionism, it is clear that the situation has moved on in every sense. Searching our heritage for obscure references to prove that Jewish self-determination is forbidden before the Messiah’s arrival is the worst kind of self-defeating futility. Can’t they see the truth? God has provided us with our very own sovereign country, in the very land that was promised to our forefathers, and in exactly the way that was predicted by our earliest prophets. 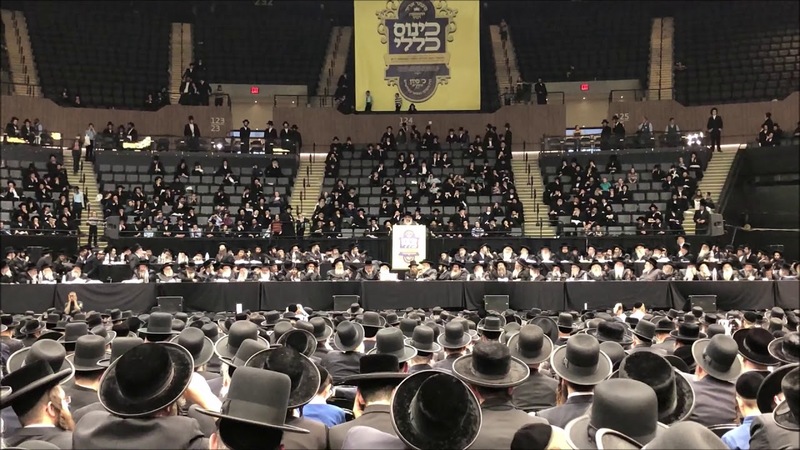 No, Satmar Rebbe, it’s not those Satmar Hasidim who celebrate Israel’s successes who have got it wrong – it’s you and whoever wasted the money to pay for the Nassau Coliseum to stage this retrograde rally who have got it wrong. You and your fellow-travelers are living in a time warp, unable to climb down from your rotting anti-Zionist tree to join the vast majority of Torah-true Jews who have no difficulty recognizing Israel and its existence for the prophecy-realizing miracle that it so clearly is. The issue I really grapple with is whether or not religiously observant Jews who reject the State of Israel and decry its existence actually believe in God. After all, how can one reject the realization of prophecy, and the miraculous nature of Israel’s sustained survival, and still believe in the God who gave us the very Hebrew Scriptures which contain the blueprint for everything that has unfolded and continues to unfold before our eyes? Intriguingly, I came across a commentary by Rabbi Moses Sofer of Pressburg (1762-1839) on the portion of Shlach that seems to address this exact point. The reason I find it so intriguing is because the intransigent zealotry of orthodox anti-Zionism has its roots in an absolutist interpretation and adoption of the “legacy” of Rabbi Sofer by a faction of his followers during the second half of the nineteenth century. The reaction of the Israelites to the negative report delivered by the spies upon their return from Canaan, and their insistent demand that the nation return to Egypt (Num. 14:3-4), prompts Rabbi Sofer to question their true commitment to God. Having received the Torah at Sinai in the knowledge that their next destination was the Promised Land, their desire to abandon this mission on the basis of some worrying information, and to return to the land where they had suffered slavery and persecution, can surely only be interpreted as an explicit rejection of God. But Rabbi Sofer dismisses this analysis as a profound misunderstanding. On the contrary, this entire episode is a primary example of misusing God and religion in the pursuit of deviant goals. The spies came up with countless reasons why going back to Egypt was exactly what God really wanted – the exile had not yet expired; the Israelites had only come into the wilderness to receive the Torah, and now it was time to return to Egypt; God would miraculously empty the Promised Land of its inhabitants, and then they would take it over, but meanwhile they should wait in Egypt. The Israelites who listened to this group of distinguished holy men addressing them that day at the Sinai Desert’s version of the Nassau Coliseum lapped it all up, and became utterly convinced that God wanted them to return to Egypt, believing that it was Moses who had got it wrong, not them, and certainly not the ten esteemed princes of Israel. As it turned out, what the spies perpetrated was a gross misuse of religious influence. Almost as soon as they had fallen for the lies of the spies, the nation realized their mistake and attempted to launch their own invasion of Canaan. But it was too late. The military campaign was a disaster, and it would be forty years before they were able to enter the land. When religious leaders misuse religion and our devotion to God to promote ideologies that are offensive to God, we must immediately call them out and redouble our efforts to stay in lockstep with God’s mission, as expressed to us by our most revered prophets and texts. Israel represents "the most important theological development for Judaism in thousands of years?" I think you've hit the nail on the head. A state should not be a "theological development." Indeed, the two should have nothing to do with each other, but so it has become. Nationalism can lead to terrible things, especially religious nationalism, and it shouldn't be required of anyone, least of all traditional hasidim, to transform their religion into the nationalist one to which you apparently subscribe. Join the crusaders and jihadis if you will, but leave the hasidim out of it. As R' Aharon Rakeffet has said on multiple occasions: One cannot be a true Religious Zionist without learning VaYo'el Moshe. Just as in general, you cannot have a real position in any machloqes without knowing all sides in the sugya. No, Aguda never believed in vayoel moshe style anti zionism. They were almost wholly concerned with the non religiosity (not the anti religiosity) of the leaders of the movement. Ben Gurion was not secular, he had a religious belief in the state of israel. And that religion of his usurped judaism and was considered a danger by many Rabbis. See R' Pardeis's first-hand report of the 1937 Kenesiah Gedolah in HaPardeis 11:7. I believe you are mistaken. It did not stop with a fear of the Zionists, they declared the foundation of the Medinah to be prohibited. R Elchanan Wasserman and R' Aharon Kotler are among those named as signing the declaration. That version of anti-zionism has a lot to be said for it, today as well as in the past. The proper attitude to zionism is to applaud it where it furthers Jewish goals and to condemn it where it goes against Jewish goals, which it very frequently does. Certainly, no-one should ever call oneself a 'religious Zionist' (dati leumi, by contrast, is fine, though, ideally it would be enough just to say dati). Vayoel Moshe should not be read by anyone. It should be burnt. I don't mean that as a hyperbolic outburst, but as a plain statement of halacha. Zichron, I would hesitate to tangle with R' Micha without presenting sources. R' Micha: I don't know if it's accurate that the Satmar Rav's position reflects that of the vast majority of prewar Rabbis. It is interesting that you reference Rabbi Rakeffet, as in his most recent lectures on the Agudath Harabbonim, he points out that most American rabbis were either affiliated with Mizrachi or positively disposed toward it. He could only recall the name of one true Agudist from his youth. I concede the point about reading VaYoel Moshe, but I think that anyone who takes textual analysis seriously will be taken aback at the sophistry and polemicism which characterizes the work. Mishkenos Haroim is a forgery. The three oaths were quoted by Rav Kook too. The question is if it prohibits any kind of self government, even if allowed by the Nations etc. If R. Rakeffet said that then he's dead wrong. I assure you, no one in Williamsburg or Monroe believes you need to read Am Habonim Smacha to be a good yeed. And in that respect they're 100% right. But their willingness to study and teach both sides of their disputes is one of the reasons we hold like Beis Hillel, and not Beis Shammai. The Netziv defines the sin'as chinam that cost us the Second Beis haMiqdash and sent this on this exile as not having respect for people who honestly reached different conclusions and declaring them heretics. Respecting their opinion and understanding how they reached it isn't just the moral high road; it's the only way to really understand why we disagree. Recall, this is also the community that has the greatest percentage of people involved in bikur cholim. Their love of Jews, including Zionists, is undeniable. (Or should be, if more of us were unbiased.) Regardless of what they think of Zionism or the State. Don't repeat the mistake of the generation of the destruction and turn a fight over ideas into one about people. I am no fan of Satmar extremism and share the mainstream chareidi view, namely maybe it is maybe it is not? Nobody knows for sure. "Reishit zemichat ge'oluteinu" is as much as a dogma as any chareidi belief. There is no evidence for that. "After all, how can one reject the realization of prophecy, and the miraculous nature of Israel’s sustained survival, and still believe in the God who gave us the very Hebrew Scriptures which contain the blueprint for everything that has unfolded and continues to unfold before our eyes?" Right. So a secular country in the Holy Land was the prophecy over thousands of years, was it? I was about to comment on this empty article, but you beat me to it. Well said. The "Prophecies" were written for and spoken to the Jews of ancient times who were distressed about actual or potential invasions and loss of monarchy. After an invasion/weakening or loss of monarchy, the prophets were giving hope to THAT generation. To imply the prophets refer to the rise of Israel thousands of years later is reading too much into the prophet's intention. BTW - so far no Israel monarchy in sight, no Davidic line AFIK, and hopefully no new temple with blood sacrifice to the Lord who loves the smell of burnt flesh. Obviously you dont see it either. Take off your narrow minded lenses and see that its not just a secular country in the Holy Land that is the fulfillment of the prophecies over thousands of years. Rashi: כשתתן ארץ ישראל פריה בעין יפה - אז יקרב הקץ, ואין לך קץ מגולה מזה. I guess you are another jew sitting in chutz laaretz content with your wonderful life that you dont even see whats unfolding right in front of your eyes. Its a shame. 1) To formally adopt as one's hashkafa that "heck, who knows," is really a very low point for Jewish thought. But I suppose you can't expect much from American Haredim hashkafically. 2) Rav Hirsch uses the verses of the Tochacha to prove that the eventual geulah very well may come through worldly, political, non-miraculous channels. Maharal clearly states that before the eventual rule of Mashiach, there will be a secular ruler in Israel. It is not your fault that these sources were hidden from you by your rebbeim, but it is your fault that you did not bother to ascertain whether or not great, decidedly non-Zionist rabbis believed that something like the current state of Israel could indeed be the "reishit tzemichat geulateinu." Zichron, I find that it is extremely easy to counter the arguments of others by applying rude descriptions to their writing, rather than devising actual arguments. "doesnt matter if its secular - read the tanach" - What is that supposed to mean? My torah says black and white, that there is a clear connection between shemiras hamitzvos and Jews living in Israel. A state which stands not one iota for shemiras hamitzvos (ok, they allow it to be practiced, big deal, so does the US), and as a policy will transgress based on societies needs (eg moving turbines around on shabbos) does not tick that box. Who decided that your points 1 - 6 have priority over the fact that the state is secular, and on what grounds, hence forfilling the prophecy? @ Zichron Devorim please source the gemoro and when was it written. No doubt if there were prophets in times of gemoro those prophets would make up promising future predictions. But since the Rabbis got rid of prophets and prophecy, there were no prophets around to speak to the people. NO PROBLEM. Just claim all those old prophecies of hope still apply. Seems like Rabbi Dunner - like the Satmarers - appear to have their own subjective ideas about 'truth'. I can do it too. Here goes: Teitelbaum, Dunner et al are BOTH wrong. The 'truth' (see? - I can use that trick too!) is that the modern secular state of Israel was created WITHOUT God and BY - overwhelmingly - secular Jews who were sick and tired of their ongoing persecutions and through backbreaking effort and sacrifice through sheer physical and mental effort and BACKBREAKING service to the cause of nationalist secular-democracy and LABOUR values created the State of Israel - meant not to be a replica of any theocratic nation - but a receptacle where all Jews - or who call themselves Jews - can reside in PEACE and be LEFT ALONE and live their lives as they please. While much of the religious Jewish world went on with their lives - secular Jews realized this 'Prophecy' (all so easy with the benefit of hindsight') only to see the state fought over by religious sectarians and theocrats who all claim or reject the sanctity of the State according to their own NON-RATIONAL whims. Aside from nice slogans, R'Dunner did not provide any theological refutation of the Satmar position. While I, like most non-Hassidic orthodox, support Israel, my support is emotional rather than theological. I have not seen any series refutations of anti-state theology from anyone else as well. We have Talmudic and other classical sources that do suggest that it is forbidden before Mashiach. Most such sources, such as Kesubos 111a are particularly based on psukim in Shir Hashirim. Those who criticize Satmar would rather be specific by addressing these commentaries. When you get a moment, spend some time on Eim Habanim Smeicha. Two good translations. I use Lichtenstein's. It's only 500 pages, a quick read, of Torah sources explaining the importance of developing and living in Israel. Sounds like what you've been looking for. There are certain positions that can only be proven by a genius. Such positions should naturally be met with skepticism. That purified שרץ on your far right for example. There never ever was such an invasion, and thus the oath was never violated. By the Satmar Rebbe's admission the legal force of the oaths (according to his understanding the Rambam) is based on the position that בחומה means the majority of the people. Yet he selectively argues this point exclusively to "prove" the Rambam held of the Three Oaths. Does it matter that he deviates from his own interpretation of the Rambam to claim that חומה is a large minority? According to the Satmar Rebbe, the concept of חומה means a show of faith, and thus includes any large group even if be non-armed, peaceful, and even if demanded by the nations upon the pain of death! How does he do it? He simply "borrows" interpretations of the word חומה from other מדרשים and sticks them into our גמרא in כתובות 9 (i.e. he engages in conflation). Never mind that such a forced interpretation is add odds with centuries of מסורה. Who before the ויואל משה made such claims about the oath? Like so many other issues in halacha and Jewish thought, the phenomenon of modern Israel too is a complicated sugyah. Going one way or another should not lead to accusations of heresy and being a meragel. I agree that we should support Israel. But for many/ most of the founders of Israel, it was not just "callous indifference" to religion; it was a positive hatred of Torah, a drive to create the "New Jew" who would have contempt for the Torah, and an active effort to minimize the aliyah of Orthodox Jews during the pre-State period. Even if we still disagree with Satmar vehemently, some study of the above phenomena from the secular histories themselves might help us understand where Satmar is coming from. Correction: the author wrote "callous rejection". My point still stands. According to Satmar, everything comes from Hashem except for two things: Yiraas Shamayim and the State of Israel. Thats the only way to explain their idiotic position. "when it is so clear that Israel represents the most important theological development for Judaism in thousands of years." So the author is sure that Satmar is wrong about God's will but the Author is confident that he understands God's will? It would be nice if the likes of Rav Avrohom Gordimer would write a piece like this? These fools have strayed from yiddishkeit more than Rabbi Avi Weiss could ever dream of. Yet, we hear crickets from the YU crowd about satmar but they constantly rail against OO. To see G-d's will, take a flight to Israel and spend a few weeks touring around. If you go north to south, east to west and you talk to the people and listen to them well, if, after all that, you're still anti-Israel and think G-d's not at work here, I got nothing. One thought I always have when I hear this kind of discussion is this: As a practical matter, do we want our whole country to be ruled by the same religious authorities as run (or dictate?) things to us the way they are (trying to?) doing now? Do you really want to give up any voice, much less choice, in how you live your life, and place your life in the hands of men who don't live like you do, don't have the same education and experiences that you do, and don't always very well understand you? Is Charedei theology and practice the penultimate form and should that be the only option? How many Charedei people go off the derech because they don't see a way to live a frum life that they can accept and manage? This is, I think, what people who want Israel to be a Charedei theocracy really desire and are trying to achieve -- a monolithic Yiddishkeit according to only their understanding of it. We are an arrogant and conceited bunch. Sure, if I treifed a spoon, I would only ask certain rabbis what to about it. But if I have a personal problem, have some problem dealing with life itself, I may look to clergy outside of our little circle for life advice. Indeed, this is what I once did and it was perhaps the best wisdom imparted to me my any rabbi. She was wise and insightful in ways only a fool would not value. She got me in ways I don't think anyone other than perhaps my wife does and so she was able to give me a suggestion that was right on target. You want to call me a heretic? Not my problem. I don't need an alyiah at your schule. There is value in all of us, even if we can't agree on everything -- and this is good because it gives people valid options -- but we could at least agree that wisdom and caring are not exclusive to those who find a connection to G-d the same way we do. Israel does not belong to just one type of Jew. There should be a place there for all of us. Loving fellow Jews means to be able to respect and accept -- and leave alone -- those Jews who want to live differently than we do. Who is Playing with Leviathan?